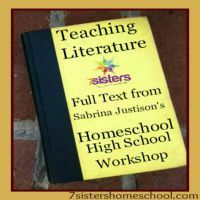 Sabrina Justison’s Teaching Literature Workshop has been popular with parents of teens and tweens over the years. In this 15-page .pdf document she shares the full-text of her notes from that workshop. Click here to view posts from the first 4 topics in this workshop.